The Ellis 36 UltraJet® is an innovative design that results in a highly maneuverable 30-knot boat which can run in shallow water without getting wrapped up in stray rope, crab pots or lobster buoys. The Ellis 36 UltraJet® bridges the gap between traditional and contemporary yacht building – twin jets on a semi-displacement hull. In this model 36, we reduced our keel 10 inches overall to reduce the draft and to give her a bit more side-to-side maneuverability – she corners quickly without significant yawing to port or starboard. This twin drive option maintains the seagoing characteristics associated with all Ellis Boats. This is due to the fact that we maintained our semi-displacement design with enough keel for a strong tracking and vessel stability. 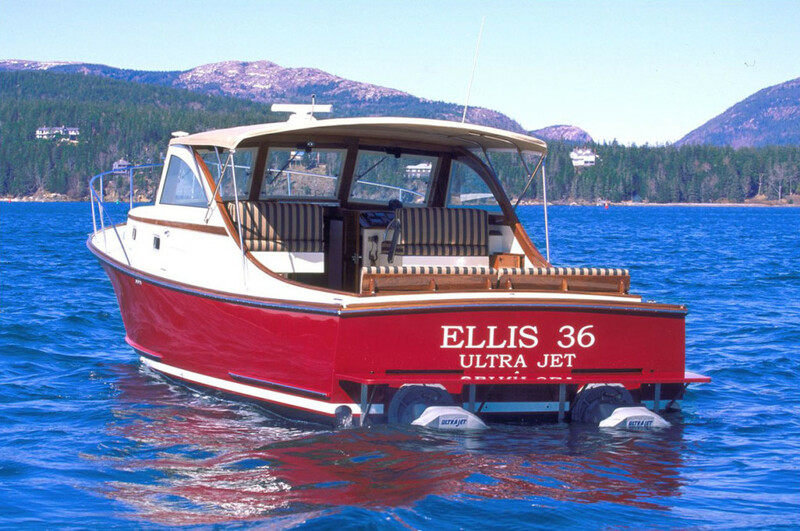 The Ellis 36 UltraJet® is available in any of our Six Ells 36 models.